Like most parts of a vehicle the transmission requires routine maintenance to remain in prime operating condition. Neglecting the transmission the service it needs, or simply due to high mileage, you're likely to run into a number of the following transmission issues. It is important that your car is serviced as soon as these problems become apparent, or else the repairs will become much more extensive and expensive. If you hear any strange noises as you shift through the gears you'll want to make a trip to the shop. Grinding, whining or squealing noises are all indicators of transmission trouble. They can be caused by worn out parts or low levels of transmission fluid. Does your car's transmission seem to just fall out of gear? Does it shift erratically? This is a dangerous issue that prevents you from being able to properly control your car. If it is an automatic transmission it may be due to a failed computer or low fluid. A manual transmission may be experiencing oil on the clutch plate or poor holding power. Do you remember first learning how to drive a stick shift? The smell that would arise as you learned to accelerate out of first gear is almost unforgettable. If you catch a whiff of that now that you're a pro at the stick shift it may be time for a clutch repair, adjustment or replacement. If your engine revs high when you shift from park to drive or as the transmission shifts between gears when in motion it may mean your car is low on transmission fluid. Transmission fluid is generally a reddish color. If you find this or anything else leaking from your car or truck it is important that you get to a repair shop for proper diagnostics and repair as soon as possible. 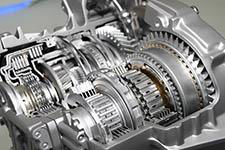 At Hye Tech Auto we offer professional transmission repair in Covina for all makes and models. Our team of expert auto repair technicians can identify and fix problems quickly and affordably. To learn more or to request an appointment for any sort of auto repair in Covina give us a call at (626) 332-5452 today!